Louise Fischer has taken a rather interesting gamble in bringing the 2009 Lucy Prebble play Enron to Australian shores. Or rather, given our passion for British humour is as much a part of our genetic makeup as our suspicion for American humor is, she made what we might call a calculated risk – something the women and men who ran the Enron corporation knew nothing about. It’s not that the subject matter is sensitive (we all hold hands to throw anything moldy at the Enron team) its more that what was so successful in London, tanked on Broadway which suggests the subject matter might be culturally specific. Or perhaps its just too soon for the American’s to laugh? Fischer has her version of Prebbles play at the New Theatre from June 4 through to 29. At its bare bones it is the story of Enron, though surprisingly (to me at least) it does go into some explanations of the notoriously complex story. 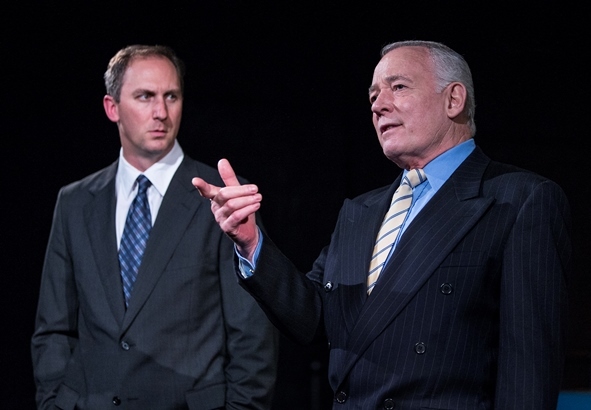 Being a far smaller budget production than the glamorous London and Broadway affairs, Fischer’s version is less vaudevillian and more Shakespearean, giving the actors more of a chance to play into the human tragedy that the story of Enron really is. This tragedy is not just the disaster many people experienced when they lost pension funds, jobs and life savings. There is also the tragedy of delusion, and the clever way Prebble humanizes these people – not so they appear to be victims, but rather so we come to understand the greatest deception was the one they told themselves. 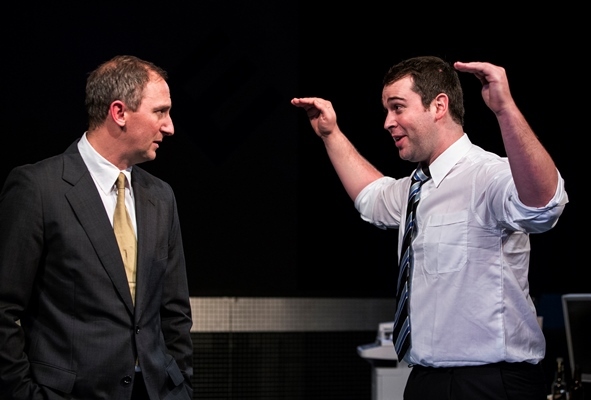 I have to add here, that one of the advantages Fischers Enron has over all the others that I read reviews for, is the remarkable look-alikes of Peter Flett as Keneth Lay and Matt Young as Jeffery Skilling. This certainly helped, and will assist all those familiar with the story, to create natural context for the theatre experience. By the end of the play both men had me thinking they looked more like the originals than the originals did. In fact, by the end of the play the look-a-likes between theatre itself and “big business” become starkly obvious, so much so that it is hard to tell when one starts and the other ends. The world of business is not just filled with empty gestures, but it fulfills the Sarterian concept of bad faith. Every moving cog in the corporations daily spin is an example of bad faith. They display the exaggerated movements, conversations and gestures that are associated with “business.” This exaggerated behavior reveals the fact that these men are play acting at being business men, making an object of themselves – that is an automaton whose sole purpose in the world is to be a business man. The fact that he is acting shows that he is lieing to himself and that deception lies at the heart of his actions as businessman. 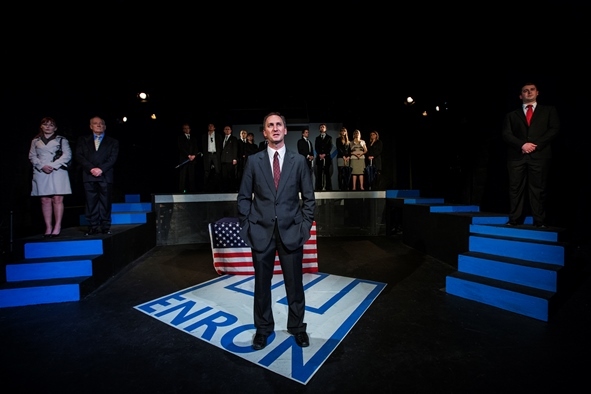 It is the play Enron, that reveals this, thereby removing the layers to reveal the bad faith at the core of their being. With all this existential angst, Enron is still very funny. Laugh out loud at the brokerage team being assembled to a “mission Impossible” theme dance number, Skillings child answering a phone call from daddy from the inside of a bubble, a dance number called “Mark-to-Market Accounting” and witty dialogue. (A particular favorite moment was watching Florida “yes/no/yes/no” on Al Gore and Skilling saying “I could handle Willy, but this guys scares me.”) Cap it all off with the clever use of Jurassic style Raptor masks for the LJM Raptors. In other incarnations the “raptors” are suited up with their dinosaur masks. Under Louise Fishers clever direction, the Raptors are female, wearing darkly seductive little numbers purring at and seducing Andy Fastow who is depicted as a tragic lion tamer whose lost control of the circus. If you are not familiar with the Enron story, I would give the wiki a fast read the day you are to go and see it. It’s not essential to have the background, but it is helpful and it ensures you don’t miss all the “in” jokes. 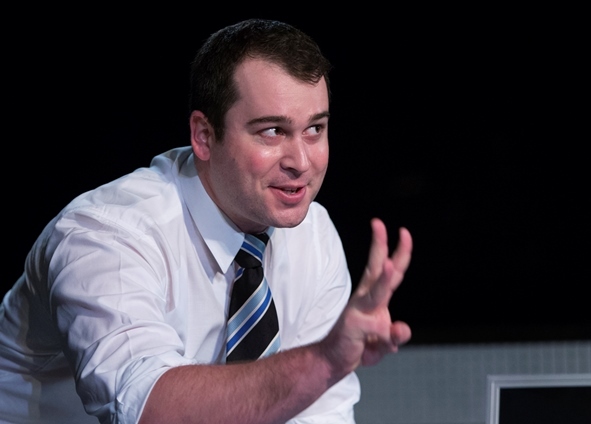 This is a clever play, exposing business for what it really is – theatre. Louise Fischer is all over this concept, in control of the play every step of the way. The sound and lighting are spot on and the rest of the cast – especially Cassandra-Lee Heschl as the fictitious Claudia Roe (an amalgum of all the women that brought Skilling down) – are not just first rate, but clearly having a wonderful time with their roles. This exuberance and joy is contagious, so that I had a huge smile on my face for the bulk of the play. You can get your tickets here, and below I have added “Turn of a Friendly Card” – just one of the great classic songs used in the play. (note) Richard Dawkins has distanced himself from Enron and Skilling, saying that Skilling misunderstood his book. Dawkins has said that he has never advocated selfishness as a means of progression.